Earlier today, Meghan Markle made a $36 H&M dress look like royalty, and now she's graced us with a second appearance of the day. 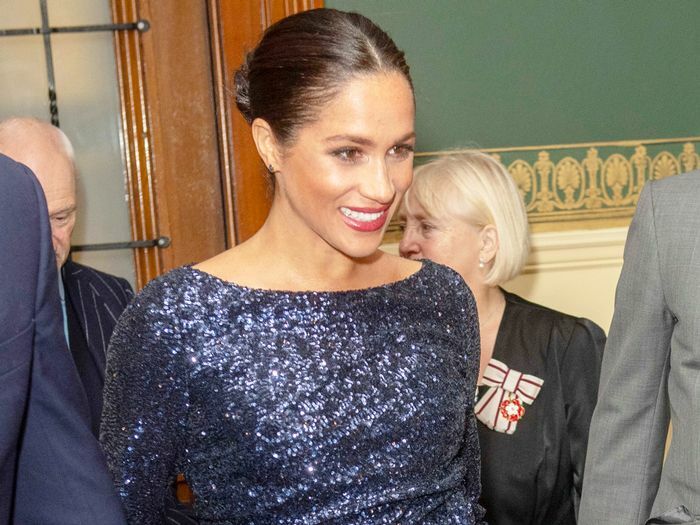 Attending the Cirque du Soleil premiere of Totem at Royal Albert Hall, the Duchess of Sussex wore Roland Mouret's Sequined Gown ($5595), a wonderfully glittery number that might just be her most Hollywood look yet. It's fitting, then, that she wore every celebrity's favorite red carpet shoes with the sparkling gown: Stuart Weitzman's iconic Nudist shoes. We've waxed poetic about the sandals many times before. We've broken down all the celebrities who own them, chronicled their insane popularity on the red carpet, and covered seasonal updates to the shoes. Scroll down to see how the expectant duchess styled her baby bump for a night on the town and shop the cult shoes for yourself. Next up, Meghan Markle's sold-out $120 flats just got restocked.